A few weeks ago I teamed up with mixologist Catherine Cheek of Christopher Piper Wines Limited and Jan, the owner of Maddocks Organics edible flower farm, to put together some ideas and inspiration we could pass on to our couples for their wedding reception drinks and cocktails using edible flowers from Jan’s farm. Catherine with her background in botanicals and her years of experience as a mixologist came up with a great range of drinks and cocktails which looked amazing and tasted even better! Jan supplied all the flowers and I had the tough job of official taster! I wanted to focus on boutique suppliers in the West Country who hand-craft their products using natural ingredients and traditional methods. 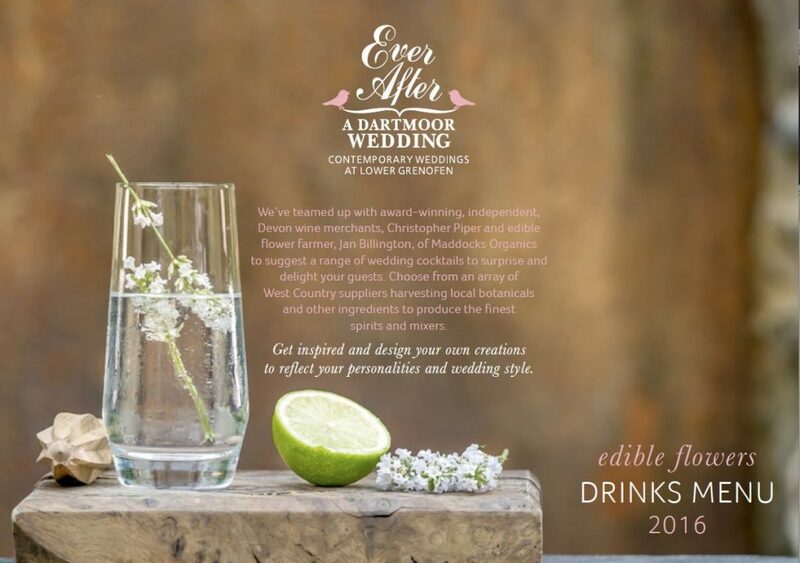 We set out to showcase West Country talent and design a list to inspire our couples to reflect Dartmoor, Devon and the English countryside generally. Catherine did a great job with that brief and selected small batch spirits and unusual artisan mixers and syrups for drinks, cocktails and mocktails to whet the most jaded of guest appetites. Jan supplied the flowers and petals for the drinks – you’d be surprised how many different flowers are actually edible. General warning: don’t eat flowers from a florist or other shop unless you have been assured that they have been grown specifically for eating. Most flowers are treated with chemicals when grown and then after harvesting so make sure your’s aren’t! Jan will supply seasonal flowers, not all flowers are available all year round so check with Jan which flowers will be available at the time of your wedding and then you can take that list to Catherine for help with the drinks list. Christopher Piper Wines Ltd give a discount to any couples booked with us, do get in touch with me for more details. Click here to download our list to inspire you for your own wedding. Catherine has helpfully included comprehensive instructions for each drink so you can mix them at home and play around with the recipe to make it truly personal.